Home » Basketball » State of the Knicks: Actually Good? State of the Knicks: Actually Good? The Knicks are so back I love it!!! Last week I fully bashed the Knicks, but little did we know, they were on the precipice of being extremely back. They went 3-0 this week which included blowing out the Cavs in Cleveland on Sunday Night. Kristaps Porzingis looks like he has come into his own and carry this team to something special while the other pieces are slowly forming around him. This week they play four games at home and I think they should be able to win at least two of those games. The first game of last week was against city rivals Brooklyn Nets in which both teams were looking to get a win to build some momentum on the season. 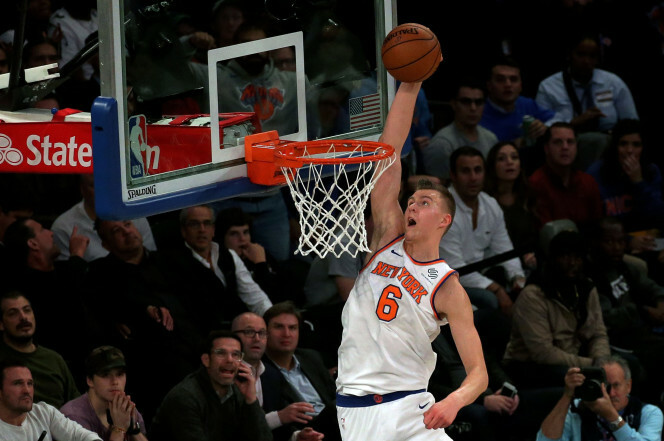 The Knicks comfortably won the game thanks in large part to Porzingis scoring thirty points. Porzingis has scored thirty or more points in five of the six Knicks’ games this season and it looks like the only thing he needed to get going was to be the primary option on offense. The second game of the week was going to be tough against the Cavs, however they have been struggling early on this season. The Knicks won the game easily as Tim Hardaway Jr. finally had a great game after returning to the Knicks. Him and Porzingis have the potential to form a 1-2 punch on offense that is going to be hard to defend by other teams. Hardaway Jr. is one of the highest players on the roster and after having a rough couple of games to start the season, he has found his stride and has looked really good. The Knicks have really struggled in the second game of back to back, so most Knick fans assumed that they were going to lose to the Nuggets on Monday. The Knicks came out firing in the first half and never allowed the Nuggets to creep back into the game. The Knicks finished a great week and are now back to .500 on the season. The Knicks offense is firing on all cylinders and is the main reason for their winning streak. At some point Porzingis is going to have a bad game, so the Knicks need to find a point guard that can get everyone on offense involved and also help elevate Porzingis’ ability even more. Frank Ntilikina is going to be come back in the next couple of weeks, so maybe he is that point guard that the Knicks desperately need. The defense has not been good thus far and needs to get better before the Knicks and their fans start dreaming about a playoff berth. The defense has been bailed out by the offense, but the offense is bound to have a bad game. I criticized the coaching staff last week, and though I still think they need to fix some holes, they should get some credit for the winning streak. The coaching staff needs to run more set plays for other offensive weapons so that teams do not double team Porzingis and he can get his shots easily. The Knicks play the Rockets at home tonight, which is going to be tough for them to win. The schedule does get a little easier when they play the Suns, the Pacers, and the Hornets all at home. All three of those teams are in the similar position as the Knicks in that they can be either halfway decent or really bad. The Knicks are still miles away from being anyway near a playoff berth, but beating average teams can help them get to their eventual goal of making the playoffs.